I know I shouldn’t open my big mouth in the middle of a baseball game, but I am guilty of doing just that… all the time here. Paul is sick of listening to me… but some things really get me riled up. Our team, the Boston Red Sox, is, at this moment, beating the Yankees, so you’d think I’d have nothing but good things to say about them… but one thing bothers me about these guys, especially the pitchers, and it happened just now with our pitcher John Lackey. He has pitched 6 good innings against the Yankees with only 1 run for them. We have 6 runs. He’s starting to get sloppy, has hit a few guys with the ball, and so the manager came out to replace him with a reliever. Fine. That always happens. 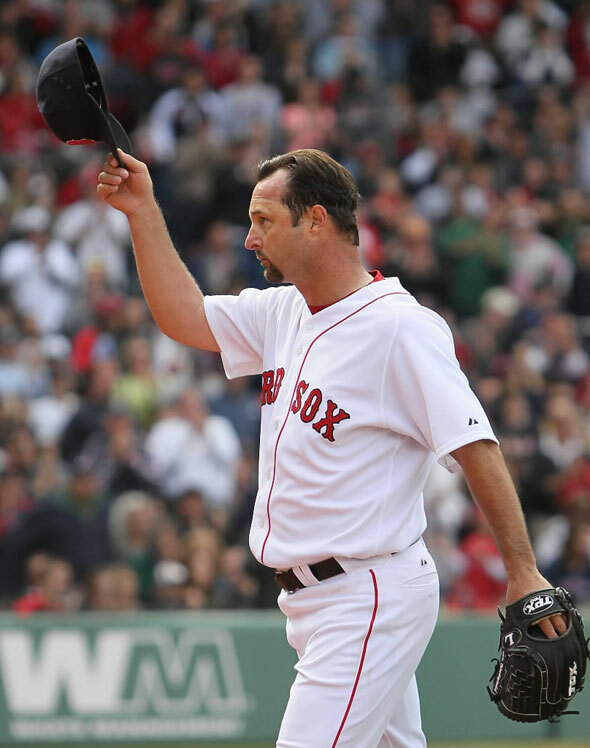 But on his long walk back to the dugout, Lacky just walks with his head down while the nearly 40,000 fans at Fenway Park are all on their feet, clapping and cheering for him… their (our) pitcher who has gotten us this far in the game so far. The noise is very loud. All in unison. …but do you think Mr. Lackey could stop for a split second, or not even stop but just put his hand up to his hat, and give the fans a tip of his cap in a quick acknowledgement of their cheers for him? No. I guess that’s too much to ask for $15.9 million a year. He goes into the dugout without ever looking up at his fans who are wildly cheering for him and for his good job. Cheers for the Red Sox fans, but reserved cheers for Lackey. He (and others) really need to have some manners pounded into them. As the salaries went up — and the advertising and naming the fields after banks — the rapport between the players and the fans disappeared. After all these years, I now have access to more baseball on tv than ever before…and I have lost interest. Each player has his own method of handling the fans. Not always to our liking. That’s pretty weird behavior, to do a good job (darn it, says this Yankee fan) and have the fans cheer you for it and snub them. Presumably he was peeved at the manager for taking him out. But the fans didn’t take him out. So I agree with you, even if someone’s a creep, how much does it cost to tip one’s hat and pretend otherwise? But then, remember, as a Yankee fan I have to hate Boston pitchers anyway!